This PDF 1.4 document has been sent on pdf-archive.com on 17/01/2013 at 20:36, from IP address 142.91.x.x. The current document download page has been viewed 594 times. 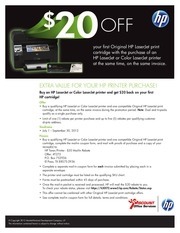 LaserJet printing in a compact size, and at a price any business can afford. • Fits in any workspace: a desk, shelf, or other small, convenient location. • Professional-quality printing with up to 1200 dpi-like output (600 dpi with REt and FastRes). • Easy access supplies for simple replacement. This file has been shared by a user of PDF Archive. Document ID: 00070262.